What Was I Scared Of? This is the title of another Dr. Seuss book that relays the message of trying new things and stepping out of your box. Applications for NAAE Awards are Due May 15th! 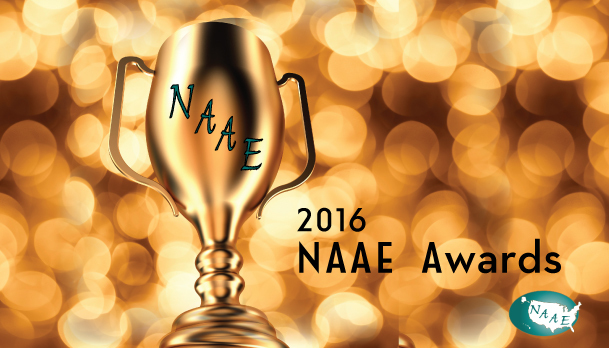 NAAE maintains an extensive awards program to recognize the accomplishments of our many talented and dedicated members. We have awards for agricultural educators in every stage of their careers, from scholarships to lifetime achievement. 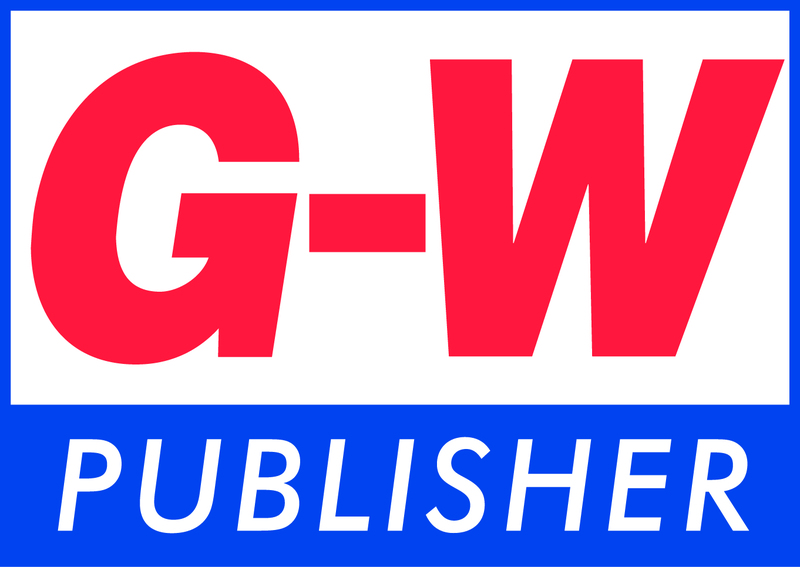 We also manage grant programs for organizations who want to help support agricultural education and agricultural educators. Agriculture is transforming every day. How are you staying current in the classroom? 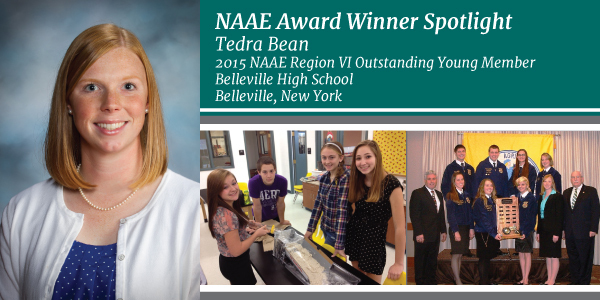 Tedra Bean is the agriculture teacher at Belleville Henderson Central School, in Belleville, New York. One priority Bean has is keeping up with current and emerging agriculture career opportunities. 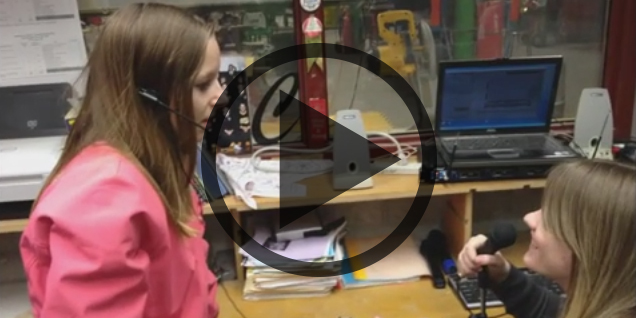 Students in Tilleman?s agricultural communications class manage their own radio station directly from their classroom, broadcasting one nine-hour show each day that commonly includes a student-conducted interview, local and national FFA news, and a playlist of music. Click here to watch a short video explaining his award-winning idea. The NAAE Ideas Unlimited Award is sponsored by Cengage Learning | National Geographic Learning. What does it take to be a teacher mentor? Who is your ?go-to? person when you are searching for advice, lesson plans, or just a listening ear? Ag education is one profession that isn?t short on individuals willing to share advice and provide guidance. Farrah Johnson is one of agricultural education?s outstanding teacher mentors. Are you interested in helping judge the 2016 NAAE award applications? The deadline to sign up is May 10th. Click here for more information and to volunteer. Register for FREE by June 3rd & Earn up to 12 hours of Professional Development Credit!Get ready for an exciting summer of professional development with our Virtual Book Club! We will read and engage with the book The Innovator's Mindset by George Couros. Just click here to register for the book club, then pick up a copy of the book & join the NAAE Virtual Book Club group on Communities of Practice to get started! Click hereto find out more! 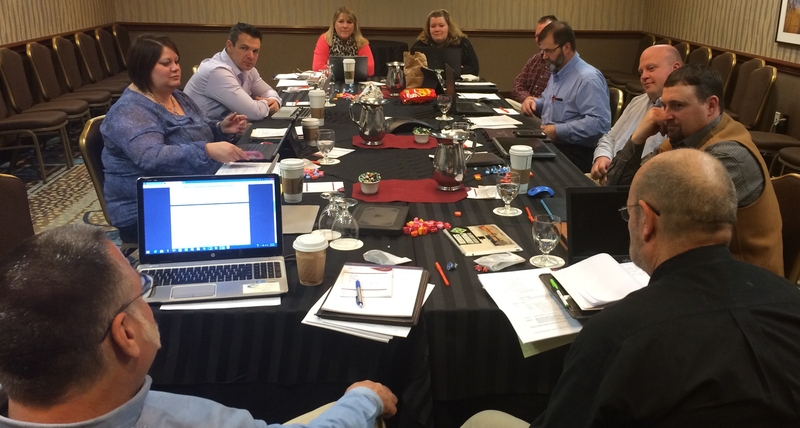 Coeur d'Alene, ID Trenton, NJ The NAAE Board of Directors met this winter to discuss member initiatives and prepare for regional conferences. Two of our members and an organizational member have been recognized as ACTE Excellence Award winners this year. Congratulations to these outstanding members for all of their accomplishments! Click on the links below to hear their stories. 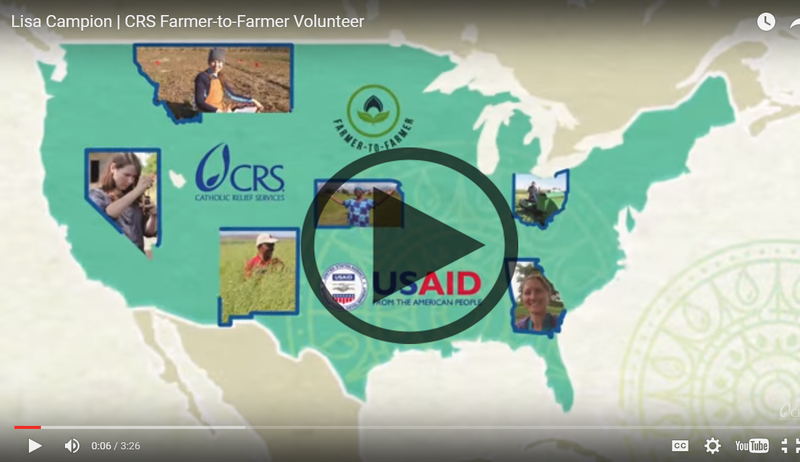 NAAE is partnering with the Farmer to Farmer program to provide technical assistance to farmers in developing countries. Ag educators are needed to help farmers in Kenya, Uganda, Ethiopia, and Tanzania improve productivity, access new markets, and conserve natural resources.Farmer to Farmer currently has more than 30 assignments available, for lengths of time beginning at 2 weeks. They also have several special projects for interested agricultural educators that are not posted on the website.Watch this video about Farmer to Farmer volunteer Lisa Campion, and contact Julie Fritsch, NAAE Communications/Marketing Director, to let her know you are interested in learning more about the Farmer to Farmer program. Are You Ready to Address Environmental Science Issues with CASE? Your Students Can Win a Trip to Indianapolis! 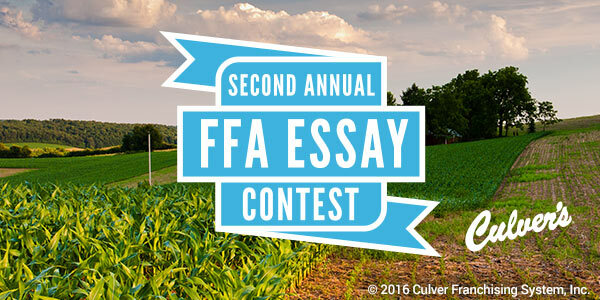 Encourage your FFA members to enter Culver?s FFA Essay Contest for the chance to be one of three chapters that Culver?s helps send to the October 2016 National FFA Convention & Expo. Visitwww.culvers.com/essaycontest for more information. Learn more about Culver?s Thank You Farmers program and its efforts to support students pursuing agricultural careers. NAAE members, their students and their families are encouraged to visit Culver’s on Scoops of Thanks Day on Thursday, May 5. In exchange for a $1 donation to the FFA, guests will receive a single scoop of Fresh Frozen Custard. Search for your nearest Culver’s restaurant here: http://www.culvers.com/locator/view-all-locations. Scoops of Thanks Day is part of the Culver’s Thank You Farmers program, an initiative that recognizes all farmers for their hard work and dedication in growing and producing the wholesome food that feeds our nation. To date, the program has raised nearly one million dollars in support of the National FFA Organization and Foundation, local FFA chapters and a variety of local agricultural organizations. To learn more about the Thank You Farmers program and how to get involved, visit http://www.culvers.com/farmers. Although her program is steeped in tradition, Bean is not afraid to try new things. Since her school is located just a few short miles from Lake Ontario, aquaculture is a high-demand career option for her students. Each year she and her students raise 30-50 tilapia in order to learn the skills necessary to operate a fish hatchery. Through this program, Bean's students also learn about career opportunities in aquaculture, water quality, and aquaponics. "By practicing these skills in high school, students will have the upper hand when it comes to being competitive in the job market," said Bean. 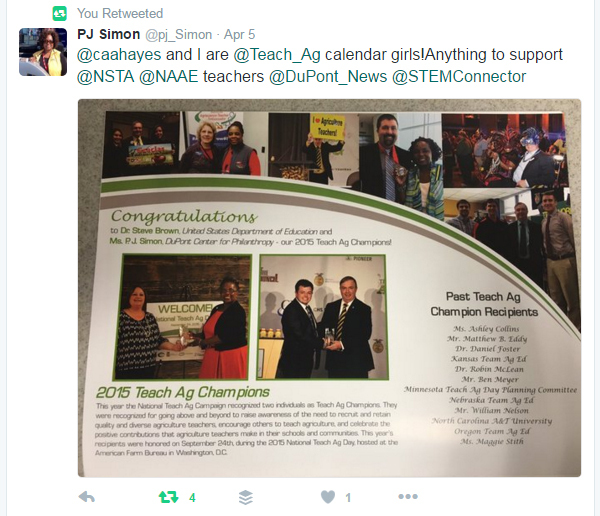 Bean contributes her drive to try new ideas and conduct classroom experiments to her training through the Curriculum for Agricultural Science Education and the DuPont National Agriscience Teacher Ambassador Academy (NATAA). "I use techniques and lessons from both of these experiences in my every day curriculum in order to introduce students to the diverse areas of agriculture with increased rigor," said Bean. "My students have more opportunities for hands-on learning in the classroom, which they enjoy." Bean has many goals for her agriculture program as she continues her career in the classroom. In the fall, her program began their first garden, which she plans to continue for years to come. Her program has also planted maple trees with hopes to delve into the maple syrup industry. No matter the content area, Bean's primary goal is to continue to try new ideas and improve student opportunities. Bean was selected as the 2015 NAAE Region VI Outstanding Young Member award winner. 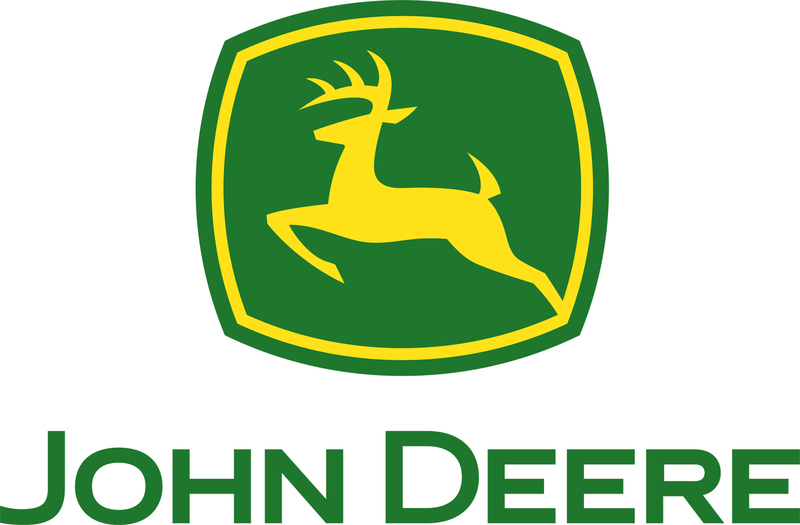 The Outstanding Young Member award is sponsored by John Deere as a special project of the National FFA Foundation. Click here to view the other 2015 Outstanding Young Member award winners. For more information about this and our other awards, please visit this link. What does it take to be a teacher mentor? Who is your "go-to" person when you are searching for advice, lesson plans, or just a listening ear? Ag education is one profession that isn't short on individuals willing to share advice and provide guidance. 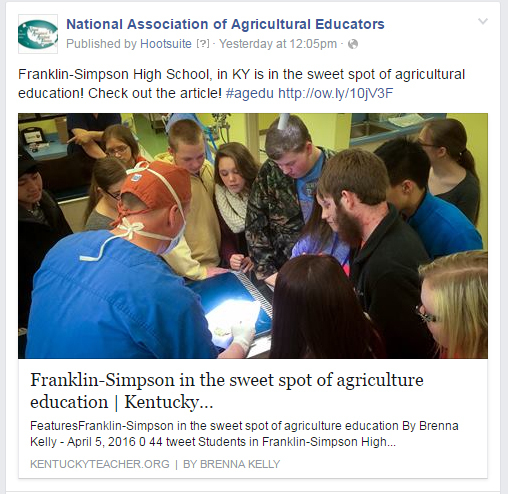 Farrah Johnson is one of agricultural education's outstanding teacher mentors. Helping others has always been an important part of Johnson's life. 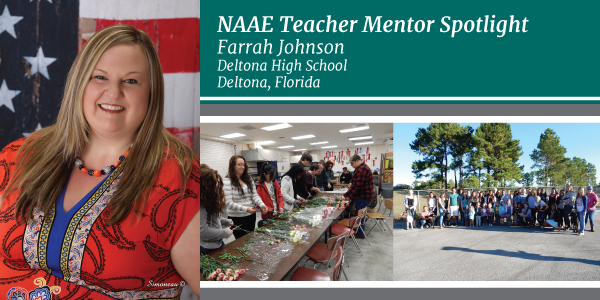 As an agriculture teacher at Deltona High School in Deltona, Florida, Johnson uses her wealth of knowledge to help both preservice and current agriculture teachers develop their own outstanding programs. "A complete agricultural education program comes down to rigor, relevance and relationships," said Johnson. "I encourage all who I mentor to work with their students in the wide scope of agriculture to try and find opportunities that excite and interest them." Formally, Johnson has mentored three student teachers, two first-year teachers, 12 new teachers in Volusia County, and three former students who are now agriculture teachers. She also presents to new teachers at conferences and offers resources, advice, and lesson plans for any new teachers looking for guidance. In addition, Johnson works closely with alternatively certified teachers to help them gain a better understanding of the three-circle model of instruction for ag education. "Working with alternatively certified teachers is much different than those who have come through a formal degree track," said Johnson. "To mentor, I must take their expertise and help them in areas where they have little to no experience." Johnson provides encouragement to her mentees through emails, text messages, and advice. She is a proponent of Communities of Practice and welcomes any questions from any teacher. 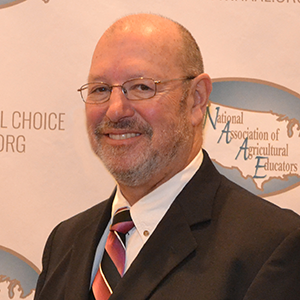 Johnson was selected as the 2015 NAAE Region V Teacher Mentor award winner. The Teacher Mentor award is sponsored by CEV Multimedia. Click here to view the other 2015 Teacher Mentor award winners. For more information about this and our other awards, please visit this link.